I joined the Instabug team in May as a Growth Marketer and it’s been about 60 days since I started. My first observation was a question: Why on earth is everyone wearing Instabug t-shirts? You know the ones companies give to employees? It turns out that people actually wear them! I get the whole “loyal to the company” and “we’re all one team” — the whole “startup culture” about “we’re in it till death”. But I mean, these people were wearing company shirts literally every single day. I understood why maybe the co-founders would choose to wear them, but I never understood why everyone else, and newbies like me, would. Then, it happened. I did it. I wore one. I have a couple and I chose to wear the “I Squash Bugs For a Living” t-shirt. I woke up one day and thought I should try it out. I was proud of being part of the #BugSquad team, but a little rebel lives inside of me. Sometimes, just because everyone does something, this automatically discourages me from doing the same. Except this time. I commute with my coworkers-slash-neighbours. They’re also my friends now. I mean we spend at least two hours stuck in Cairo traffic every day — that’s at least 44 hours per month. I spend more time with them than I spend with my friends, family, or even myself. We exchange book recommendations, we talk about work, life, and anything in between. When I reach the office, I have coffee with some other coworkers. We share articles, talks, webinars, or whatever is worth mentioning. We discuss major topics after our #BugTalks and we always have a good laugh in between all that. What do you call the people working at Instabug? The #BugSquad. I love how we’re working in Cairo and dealing with people from all around the world. We talk to people everyday from USA, China, Ukraine and more. Sometimes you receive an email at 3 AM because it’s 1 PM somewhere else. And sometimes, you’ll get a phone call at 6 AM. Yet, you’re helping all these people around the world build awesome apps and it feels great to be doing that in 2017. Great visiting the #instabug team in #Cairo. Solid #team, great #culture, & awesome product. Definitely one of the #mena #startups most likely to impress. I wrote this article at the end of a day when we were visited by Amr Awadallah, Cofounder/CTO of Cloudera. He gave an inspiring talk about his life across Egypt and Silicon Valley, his Stanford days, and what it means to have a company that recently launched its IPO. Cloudera is now valued at about $4 billion, and here was one of the co-founders, in our office, on a sunny Sunday, casually telling us his story. Saying that I love the culture is completely cliché and also doesn’t show exactly what I love so I’m going to be very specific. Instabug makes me hungry and feeds me well. Forget the amazing coffee and unlimited snacks (which are both true). I’m talking about how everyone orders food together, and then we sit at a big table to eat. It’s coincidental. There is no lunch time, not everyone orders, people order different things, and people also bring lunch from home. Yet, despite all of that, on most days, people sit together to enjoy food. You know, normal human stuff. Women occupy a sizeable percentage at Instabug. We’re not yet at the optimum ratio, but we’re doing better than the average Silicon Valley tech company. 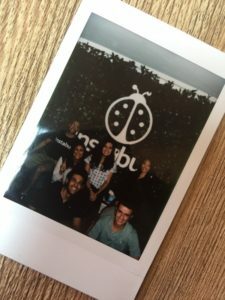 At Instabug, there are ongoing discussions about how women in the MENA entrepreneurship scene are doing quite well, and Instabug is playing a role in that. I do hope that we keep taking big strides in that direction as there is still lots of work to be done. I’m proud to say I belong to a tech company in 2017 that supports women in the entrepreneurial ecosystem. So that’s how I came to wear a company t-shirt voluntarily. A combination of an I-don’t-know-what-to-wear-morning and a team that I’m proud to call mine: the #BugSquad.